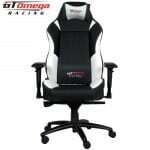 Gaming chairs have caught the attention of serious gamers and game enthusiasts alike over the last few years. 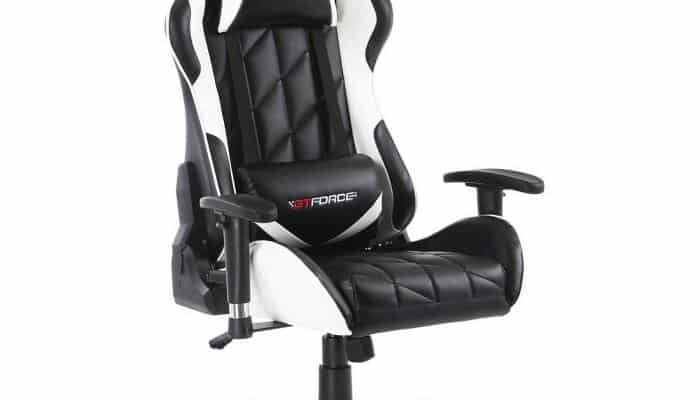 From being just another tech gadget, gaming chairs have come a long way to become an essential item for anyone who wants to get the best out of their gaming experience and for those long hour stints and streams. 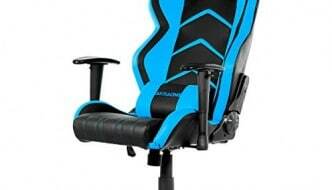 This table below gives a quick overview look to only some of the best gaming chairs we have reviewed on this site GamerChairs.UK . It will give you the quick answers to what features a certain chair has or has not. 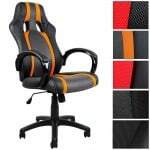 You can click on the images in the table to be taken to the full review of that gaming chair or use the navigation bar above to be taken to all the reviews we have done for many different gaming products, these include PC gaming chairs, Console gaming chairs, Gaming Keyboards and gaming mice. 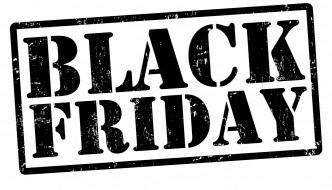 We have reviewed all the top chairs to help you out, all with budgets from under £100 to over £400. You can sort the options from your favourite console or if you need your chair to have built in speakers or even the price. To sort the table just click on one of the table headings. 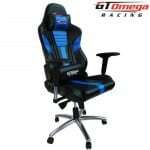 GT Omega PRO Racing Office PC gaming Chair Black combines premium luxury with high performance. Built with aluminium star base and high-quality ball bearing casters, this chair is as sturdy as it could be. The chair provides exceptional back support and has removable cushions for additional head and lumbar support. The unique design hugs the body perfectly with great shoulder support that is suitable even for people who are of the fairly large build. This chair has a great range of options on tilting, with 90 or 180 degrees backwards tilt for a quick nap, if you so desire. Adjustable armrests ensure that you no longer have to worry about proper support for your arm. 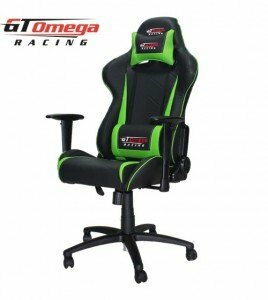 With an elegant but very attractive design, GT Omega PRO Racing is also apt for your office too; you would no longer dread the long hours! 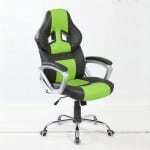 The chair is covered with black and green synthetic leather and has a load capacity of 120 kg. Easy to move around, GT Omega PRO Racing is a must have if you are looking for style, but do not want to compromise on the features. 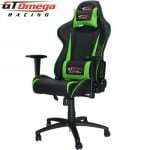 Check out out GT Omega Racing Coupon Code to save on yours. 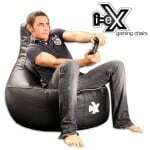 Hi-BagZ is the most sought after gaming bean bag in Amazon with the highest approval rating. Keeping the comfort level of the gamer at the highest priority, it has a high back that provides proper back support and neck support. 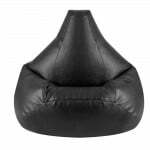 The bean bag is made from the only the highest quality faux leather with special embossing. Since it is made from faux leather, it is easy to maintain; any spills or stains can be removed easily by wiping with a damp cloth or sponge. It’s unique ergonomic features ensure highly pleasurable experience whether you are indulging in your favourite game, watching TV or reading a book. Hi-BagZ® comes in XL size and needs a mere 1.05m square floor space; it is easy to move around and comes ready filled with high-density EPS bead that ensures comfort for a very long time. Built strong to withstand the high usage with very stylish looks, it is available double zipped and stitched with over-locked and over-stitched seams. 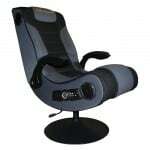 A must have if you are looking for an economical, yet sturdy and comfortable seat to enjoy your favourite games. Just push the bean bag into your favourite position and sink into it and you’ll be happy to have made the decision to make it your own. 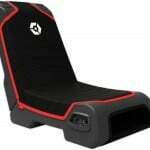 DX Racer PC gaming chair is for the gamer who is looking for the best of comfort without compromising on the looks from his chair. With the car racer styling, the chair is sporty and solid to the core. The design is very ergonomic and is recommended by many users who are impressed with the high level of comfort it provides. The chair has a variety of adjustment options available; right from height adjustment to tilt function. The armrests are also adjustable giving the user maximum control on the seating position. The DX Racer chair also comes with additional removable cushions for customising the back and neck support. With high-quality padding in the seating area and backrest, the chair is designed to give the best user experience for long hours of use. 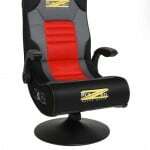 The chair is available in Red/Black design, made of 100% nylon cover, it is easy to maintain. Tested by Technischer Überwachungsverein (TUV) for quality and safety standards, the chair provides one of the best options available for someone who wants to spice up his office or home. The chair is delivered disassembled but is very easy to mount with some basic operations that are detailed in the instructions. If you are looking for an ergonomic office chair that doesn’t compromise on the looks, this could be the one for you. The Swivel desk chair comes with a formed seating surface that ensures the comfort of the user. Not only the seating surface, but the backrest and headrest are also comfortably padded to ensure the best user experience. The chair comes with a tilt function and has adjustable height options. They makers have kept the user comfort at the top of their priorities and have ensured a design that would allow free flow of air in the backrest; this would ensure that there’s enough ventilation even while sitting on it for a long duration. The backrest not only fits comfortably into the contour of the spinal cord but being big enough, it also ensures that even a very tall person fits in comfortably into the chair. 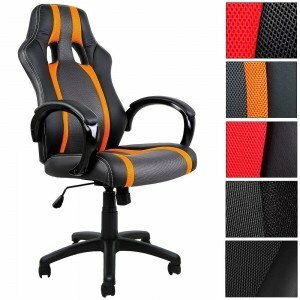 The Swivel chair, available in attractive colours like Orange, Red, Black and Grey, is sure to catch a lot of attention. 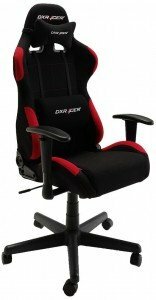 If you are looking for an office chair or an ergonomic chair to enjoy your long hours of games from, this is a well-built and economical option. 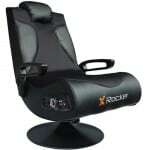 X-Rocker Vision 2.1 Gaming Chair is for the discerning gamer who wants to enjoy a hassle free gaming experience. 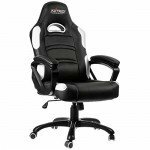 With a very comfortable seating position apt for an engaging gaming experience with every gaming console, the chair is truly a gamers delight. X-Rocker Vision 2.1 Gaming Chair has a vibrating feature that provides a higher level of game feedback; with surround sound speakers that connect wireless and producing ample bass, the gaming experience would be more immersing than ever. 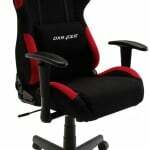 The chair comes with double padded backrest for the most comfortable gaming position. Quite a stylish furniture, it comes with a breathable fabric cover and black leatherette, designed for long hours of usage. Maintenance is hassle free too, with stains removed with the wipe of a cloth. Whether you are looking for a relaxed gaming experience or some edge of the seat moments, X-Rocker Vision 2.1 Gaming Chair provides experiences that you would look forward to. 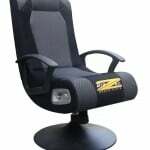 The chair comes with a wireless transmitter to connect to your TV and can also play iPods/iPhones. If you are looking for a chair that you could recline to for an engaging game or watch your favourite show on TV, this is your best bet. Video games, till about the early years of this century, were hugely restricted by the limitations of technology and its adoption across the globe. However, with rapidly increasing access to internet and free market, people across the globe started actively engaging with video games. These, in turn, helped the gaming industry make bigger investments and achieve huge technological strides. Each aspect of the game was now closely scrutinised to see how it could be bettered. Aspects like graphics and audio were the first ones to see a marked improvement; this was soon followed by several other features like improved responsiveness and accuracy of response. Newer forms of advanced gaming consoles took on the market which was soon replaced by even better ones. While games improved tremendously, one aspect of gaming remained without much difference for a while; the chair. It was however not long before serious gamers understood the necessity of comfort. It was clear that being in a more comfortable position resulted in a marked difference in their overall performance in the game. Chairs available at game clubs were better than those used at home, but those were very costly. Moreover, those were not the kind that could be used at home and usually took up quite a bit of space and effort to set up. People soon started churning the conventional chairs at home and started using bean bags while they were engaged in games. These provided better flexibility than the conventional chairs; seating positions could now be changed as per preferences of the player, bean bags were also easy to move around. Now that the benefits were clear and the needs identified, many companies started developing chairs to suit the specific needs of gamers. Through their optimal seating position, chairs for gaming are designed to provide comfort to the user during long periods of gaming. Many are manufactured with inbuilt speakers in the headrest to provide a richer user experience during gameplay.